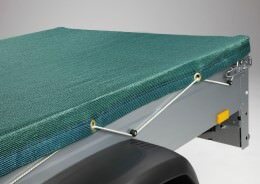 We offer nets for securing cargoes on passenger cars, and covering nets for trailers and flatbeds. As their name suggests, such cargo nets serve to secure transportation goods and to protect them from being damaged due to slipping out of place. Conversely, simple trailer covering nets or flatbed nets serve to protect objects from being thrown off and/or to stabilise objects vertically. 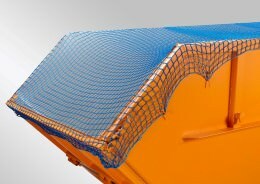 Trailer cover nets were first certified by DEKRA, as ours are today. Certification makes us a trustworthy partner in the area of securing cargoes. Conversely, simple trailer covering nets or flatbed nets serve to protect objects from being thrown off and/or to stabilise objects vertically. For this purpose, we offer you variously deployable cargo securing nets: they can be used as securing nets, transportation nets, trailer nets and flatbeds nets. 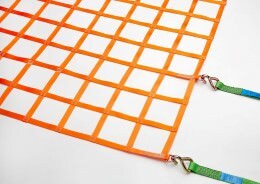 The material thicknesses used for the cargo net have a very long service life and the material is of high quality. Designed and intended for professional use, our nets definitely can’t be compared to products from DIY stores. The mesh size required depends on the cargo to be secured. We’re happy to advise you if you need to secure a cargo on your car.